Is it time to stick a fork in Black Friday and Cyber Monday? The traditional shopping weekend is certainly losing ground to discounts offered on Thanksgiving Day and other early holiday promotions. Still, it’s not all bad news early on - Black Friday and Thanksgiving day sales set new online sales records. Many retailers are offering the aggressive discounts throughout November and December dragging out the holiday season, and many more people are forgoing the mall experience (Parking, crowds) and shopping online. 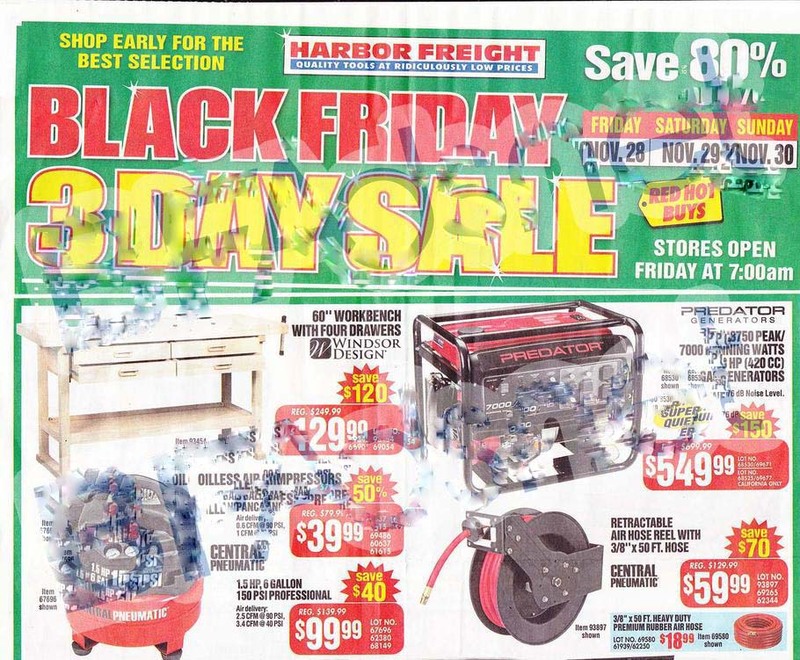 The first leaked Black Friday ad was from Harbor Freight way back on October 14, 2014. Other Smaller store charins leaked their ads next, capitalizing on the limelight for a short time. Some stores including Home Depot and Walmart sent legal warnings threatening action if their ads were posted early. They were forced to expose their ads when Target unfurled their ad, over a week before Black Friday. Consumers are now better able to determine where the best sales are on the products they want, thanks to new apps available on smartphones and tablets. Several apps available now allow you to scan a barcode on a product and see real-time pricing on it at stores in your area and websites. As such, more people are taking advantage of the very best deals, driving down overall sale volume as a result. Four-day reports from other retailers were optimistic and emphasized strong Thanksgiving Day sales. On average, shoppers spent $380.95 - and mostly on books, clothes, video games, and electronics. Almost half of that was spent online - a nice bump for online retailers, but an overall 10% decrease from last year. As expected, deeply discounted items sold out the fastest - including door buster TV’s, tablets, and video game systems, including the new Wii U, which sold out in hours in most retailers. Maybe due to the new Smash Brothers release? We at BuyVia think there’s little doubt. With all the press regarding falling iPad sales, iPad deals at Target, Walmart, and Best Buy sold out within 15 minutes. Black Friday is clearly focus more towards specific stores and products, less on general across the board discounts. So - back to our original premise; is it time to say a merry farewell to the concepts of Black Friday and Cyber Monday? Peak shopping hours also shifted in response to extended sales dates. For instance, may retailers reported that Wednesday night and Thanksgiving day were busier than Black Friday. The first Black Friday sales started as early as Wednesday 8:00PM PST, and many retailers enabled sales pricing at midnight PST. Major retailers, including Target and Best Buy, slowly rolled out lower pricing during the day and into the evening. Still, there were some other issues driving down overall retail sales. Consider BestBuy.com was down for several hours on Black Friday. Always the optimist, Best Buy updated their logo for the weekend to “Nobody does Black Friday like Best Buy” - just minutes later, their site and mobile app went dark for several hours starting 7:00AM PST and another crash in the evening. The culprit? A surge in mobile buyers was blamed. Smartphones accounted for more Black Friday and Cyber Monday mobile traffic than ever. At BuyVia, we saw over 75% of our users utilizing our apps, and only 4% of our users utilized a desktop browser. Trends that just keep growing every year. Target was also not immune to the onslaught of mobile devices this year. Although the site was not dark like Best Buy, visitors reported slow loading product pages and an inability to add certain items to their shopping carts. Walmart.com seemed to fare best, with no reported website issues. A spokesperson stated it’s website had broken all previous records with over 500 million page views. Walmart declined, however, to release specific sales figures. Still, many visitors reported out of stock notices early Friday morning on Black Friday issues. So - while they may have dodged the mobile bullet, they seem to be suffering from stock, supply chain and/or logistics issues. BuyVia notes that they were the one store that had the fewest items from their Black Friday Ad available online and in store. Toys R Us came in second with most items advertised for in store pickup. Home Depot also did not report any website issues. They released their Black Friday ad last among major retailers, so this may have contributed to their sluggish sales. Dell lacked many compelling doorbusters too. Cyber Monday is always interesting, as you do not see leaked promotions, months in advance. Consumers need to go from website to website looking for deals. Some stores blew out items that did not sell on Black Friday, but most had lots of sale items along with an additional percent off discount. Some online stores continued the same Black Friday discount, including Abercrombie and other clothing retailers. The more aggressive sites extended their Cyber Monday discount into Tuesday, like Gamestop, Performance Bike, Aeropostale, Forever 21, and others. Utilizing these discount, savvy shoppers were able to get great deals on a wide range of products. Unlike Black Friday, you have much more leeway to get a good deal. Prices were some of the lowest of the year, perfect for early shoppers. BuyVia saw steady traffic on CyberMonday, clearly people shopping at work. Thanksgiving Day saw over 43 million people shopping, also a new record. Yet, we stated earlier, the first deals for Black Friday began appearing early Wednesday evening. What about next year? Would it be more honest to call it Black November/Cyber December? At BuyVia, we think so - more so, we think it is inevitable. How did you spend your Black Friday or Cyber Monday?